The JLL R200 Luxury Home Rowing Machine is a fantastic home rowing machine. It is a magnetic rowing machine which is a design more common among the mid-range models than the top rowing machines. The rowing machine is a fantastic partner during exercise because it possesses about 10 resistance levels in total. All resistance levels on the rowing machine are noted for being challenging. The R200 rowing machine is foldable and is fitted with wheels making it easier to move it around. It is essential for rowers to be foldable in order to help conserve some precious space around. It is made up of a more solid design when compared with other rowers of a similar budget. It is designed with pedals which are large and very comfortable, with Velcro straps to prevent feet from slipping off the pedals. The JLL R200 is available in either black or silver colour. Electrically, the JLL R200 is fitted with a LCD display with 7 features. The LCD display helps to record the track count, calories burned, count per minute, distance travelled and time spent on exercise. A fantastic feature of the LCD display is the scan mode which constantly flips between main readings, meaning no buttons may be pressed during exercise sessions. Advanced belt driving system: This provides rapid engagement to allow for a great training result. LCD Monitor Display: This allows for display of main readings of the exercise during sessions. 10 Levels of Magnetic Resistance: It makes your exercise sessions all the more challenging and productive. Supports a maximum user weight of 100kg: This allows the machine to be usable by a wide range of athletes to fulfill their daily exercise routines. Impressive Design: The JLL R200 has a more impressive design than rowers of a similar budget. Every lover of the JLL R200 should note that the rowing machine is simple and straightforward. The only requirement is that users have to learn the proper ways to row. Rowing in the wrong directions or positions may lead to injury which is not the fault of the rowing machine. Users can easily lean how to assemble the rowing machine by practice and even watching videos online. Any person who has any knowledge of assembling rowing machines will have no serious difficulty in assembling the JLL R200. The assembly kit, spanners and crossheads make it easier to assemble. The JLL R200 is foldable and this allows it to save space. When fully folded it is as small as a vacuum cleaner and can easily be kept in the closet. The JLL R200 rowing machine comes with a 12-month warranty meaning your money is guaranteed in a secure way. Everything about the JLL R200 has a sturdy feel to it. It looks sturdy and is quite heavy to move around. This sturdiness and solid nature is evident of the good-quality material which was used in manufacturing. It has been reported that the JLL R200 experiences no form of shaking during sessions. Asides its solid nature, the JLL R200 is a very quiet machine. During an exercise session, the rowing machine is known to be extremely quiet. There haven’t been reports of any noise except the low whistling-like sound produced from the belt driven resistance. For operation of the JLL R200 rowing machine, there is no need for electricity. It is manually operated and the user is the motor of the machine. This feature is actually an advantage to the environment. It would also save you money on electricity bills in comparison to electronic treadmills or cross trainers. The JLL R200 has foot straps which wear out quite easily and are flimsy. The foot straps are not as durable as they should be and after using them for some time, you may have to change them. Regular maintenance will ensure your foot straps remain in the best condition possible. The on-board console of the JLL R200 is quite fragile and sometimes jamming of the wiring of the console is experience. There have been reports of sometimes an unresponsive console. Maintenance of the console is the only way to keep it in a good condition. 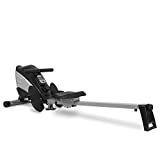 Overall, the JLL R200 Luxury Home Rowing Machine is a very good rowing machine due to the fact that it compares favourably with a lot of mid-lower class rowers of its category without compromising the quality. The JLL R200 Rowing Machine in general is a straightforward machine with good levels of resistance and a nice warranty. All this features of the JLL R200 are available for an affordable price.